Begin in Piazza Umberto I, in front the Villa Romana with its antiques museum. Then follow via Santa Lucia to the church of the same name. Continue along this lane, fringed with lemon groves, turning left at the via Villa Amena to reach the area where the Church of San gennaro and the Church of Santa Maria delle Grazie face onto a small square. Leaving the Piazza Umberto I, along via degli Antichi patrizi Romani who leads the Roman Maritime Villa. 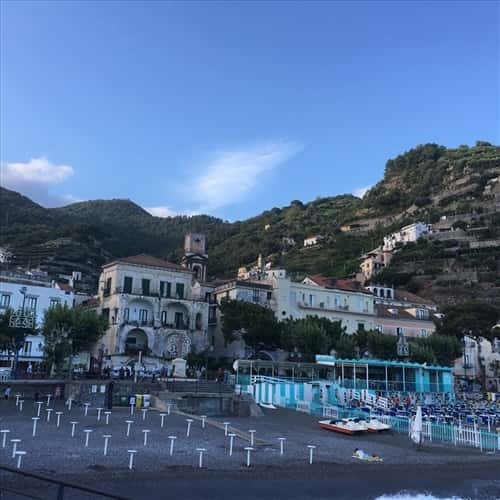 From here, after a brief visit to the magnificent archaeological area, continue along via Santa Lucia with its church of the X century, via Pioppi until you reach the upper area of Minori you can still see the remains of the old paper mills located along the resort Auriola. The path, made of dirt paths and stairs, through an area full of greenery and forests, and takes us to Forcella, the first settlement area of Minori, and the convent of San Nicola, founded probably in the early decades of the XII century. Walk from Piazza Cantilena, overlooked by the Basilica of Santa trofimena and the Town Hall. Behind the Basilica you can visit the Archconfraternity of the SS. Sacramento. Follow via Vescovado and up the steps of via Torre. Continuing up to via Torre you arrive at the village of the same name and the Church of San Michele, which offers a dramatic view of the coastal below. On the stone path up behind the chuch you can continue on to Maiori, following round on a picturesque mountain path of rare beauty. From Piazza Cantilena, along via Vescovado, we reach the steps of via Torre on reaching the village of the same name. Once at the church square of San Michele, past citrus groves and orchards, chestnut groves and forests and then we continue our path until you reach the summit of Monte Forcella where is located the convent of San Nicola. Beautiful views of Ravello and Minori during the walk.